Why Choose us for Your Fleet Wraps? Custom branded logos and graphics will make or break your success as a small business owner. If you’re looking for the most innovative and cost effective way to stand out from the competition, then stop in to chat with one of the graphic designers at Apple Graphics. Their expertise makes them one of the top choices when it comes to fleet vehicle wraps. At Apple Graphics we can design the ultimate art work and logo design for your company. We can also render detailed 3D graphics using our state of the art 3D software. Why stick with outdated methods of advertising like flyers and newspaper ads? Vehicle graphics are at the forefront of the advertising world nowadays, and getting your fleet wrapped is one of the wisest marketing choices you can make. You don’t need to worry about experience or technique when you work with a graphic designer at Apple Graphics. Our team of award winning graphics designers have over 13 years of experience in the industry. Whether you’re in the market for custom graphics, logo design or even a 3D rendering, our designers will create the perfect custom image graphics to get you noticed. If you’re thinking about boosting the flair of your advertising campaign, and if you’re looking for a cost effective means for doing so, then Apple Graphics has exactly what you need to get started. 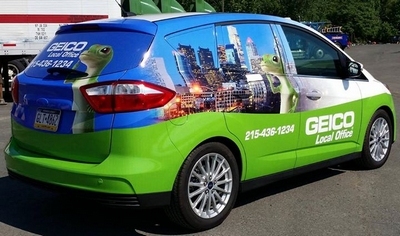 Fleet wraps generate over 500 impressions per mile. What’s more, business owners who have tried out vehicle wraps can attest to the fact that vehicle wraps work. Many happy clients claim that they noticed significant increases in their business after they integrated vehicle wraps into their fleet. The award winning graphic designers at Apple Graphics have many years experience in the vehicle wrap industry and they are passionate about the work they create. Their work embodies both creativity and technological expertise. They use only state of the art equipment and specialized software to create the highest quality design. What’s more, they only use the best materials and they stand by all of the work they complete. Stop into the shop to find out why Apple Graphics is the best choice for your fleet wrap.